Frans Hals,1580-1666, another of Holland's famous artists in art history painted one of his most famous paintings "The Jolly Toper", in 1628-30. Influenced by the art of Rubens and Caravaggio, Hals went a step farther and painted the immediacy of the moment, far different than the dignified, pre-arranged aristocratic portrait pose of van Dyck's art "Charles I". His portrait "Jolly toper", the figure raises his right hand in grasping fashion ready to catch a wine glass the instant it falls proving his state of sobriety. His face however betrays the action. His eyelids are heavy and his mouth hangs open proving what we knew all along he’s a bit over the line; or he wouldn't be acting this way. As the title "The Jolly Topper" suggests, it's all in fun and Hals has captured this moment in his art. While Rubens and Caravaggio have a more composed staged art style in portraiture, Frans Hals paints the impression he has just caught the sitter in a momentary action. 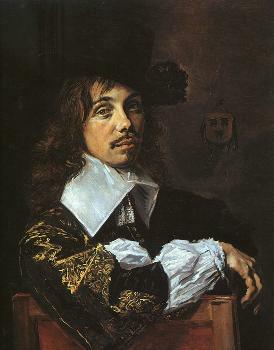 Another of Hals' famous paintings, the portrait "Pieter van der Broecke", was painted in 1633. Hals uses loose brush strokes giving the impression of a spontaneous moment. The unkempt hair, the sparkling eyes, the rosy cheeks, and the curvature of the lips tell us this is happy man. Frans Hals art and portraits challenge the viewer to search the faces and gestures of the sitter discovering a personality you already know only too well. Hals painted another one of his famous paintings in art history "Malle Babbe" in 1650. His brush strokes are quick and loose as if in a hurry fearing the loss of the moment. Hals does not articulate the reflected light on the tankard smoothly in a gradated transition from light to dark. He uses a loaded brush and then makes dabs or quick flowing swipes leaving paint on the canvas approximately where light is indicated. One stroke of the brush equals the reflected light. Hals adds tension to the artwork uses the same technique painting Malle Babbes' hat and lace, adding tension anxiety. Tension increases when Frans Hals gives Malle Babbes a sinister crooked mouth, and becomes absolutely ominous with the owl on his left shoulder! Other famous artists of the Baroque art period are Rembrandt and Rubens.